Leftover Turkey Pasta Recipe - Let the Baking Begin! Leftover Turkey Pasta Recipe with a creamy sauce is the perfect Ground Turkey Recipe! Other Leftover Turkey Recipes can’t beat this easy and delicious turkey pasta! Black Friday coincidentally falls on the same day as the all-you-can-eat-leftover-turkey-day. 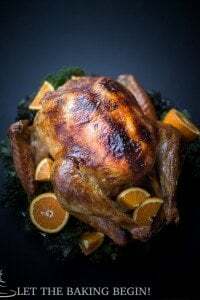 So after you come back from a day of shopping, if you do that kind of thing, you will want to make something quick with all the turkey that’s left from Thanksgiving Day! Thanksgiving turkey is the best, but one can only eat so much turkey! What do you do with all that turkey? I decided to make a Turkey Recipe that’s simple, fast, and enjoyed by the whole family! That’s when this Ground Turkey Recipe came to life. This pasta will be on the top of your Leftover Turkey Recipes list! A Pasta Recipe with a combination of Ground Turkey, tomatoes, peppers, cheese, and a creamy sauce. 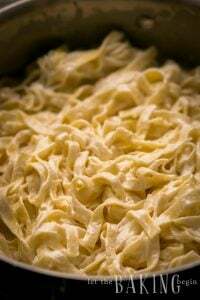 Like many Pasta Recipes, this one is such a great recipe, it’s simple to make and is full of flavor! In this Leftover Turkey Pasta, bow-tie pasta was used. You can also use spaghetti, macaroni, rigatoni, penne, shells, or any other pasta! For the best results use either pulsed or Ground Turkey. Use this Food Processor to do so! So here’s something we make every year. It’s simple, delicious and the kids love it! Try it and let me know what you think! In a skillet, heat oil over medium heat. Add onion and stir often. Saute until onion is golden. Put the turkey meat through a grinder, or use a food processor to pulse it until fine. Combine the sautéed onion, cooked pasta, ground turkey meat, pepper, and cheese. Add in the chicken stock and heavy whipping cream. Mix together and heat through until cheese is melted and the pasta absorbs the liquid. Season with salt and pepper, mix again. Serve hot with some tomatoes sprinkled on top. How does your family eat leftover turkey? What are your favorite Leftover Turkey Recipes? Chicken Tenders w/ Creamy Garlic Pasta Shells – Simple and delicious pasta recipe with chicken! 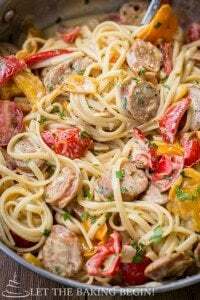 Sausage Pepper Fettuccine Skillet – Pasta with peppers onions, and smoked sausage! 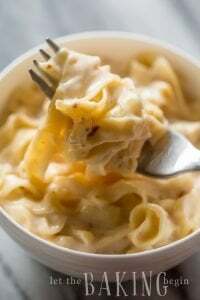 Pasta in Sweet Cream Cheese Sauce – A delicious sweet pasta recipe! Leftover Turkey Pasta Recipe with a creamy sauce is the perfect Ground Turkey Recipe! 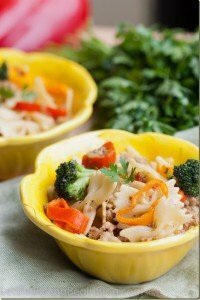 Other Leftover Turkey Recipes can't beat this easy and delicious turkey pasta! Heat couple tablespoons of oil over medium heat in a skillet, add onion and stirring often golden up the onion. Add the stock and the heavy cream. Mix everything together and heat through until the cheese is melted and the liquid is absorbed by the pasta. Season with salt and pepper, mix again. Serve hot with some tomatoes sprinkled on top.